So you like having your senses stimulated, or even assaulted on the odd occasion? Perhaps something 'busy' and colourful or, maybe, garish to look at; something jarring and discordant to listen to; well, if so, this game might have something for you. For it's overflowing with things to look at and noises to listen to and, if it were are at all possible, I suspect it would be brimming with things to smell and taste as well. 9 isn't the game to choose if you want to sit back and indulge in a few hours of relaxation or leisurely exploration and quiet puzzle solving ... it simply won't let you. It's full-on ... constantly. The game world is obviously the fun park of the writers' wildest dreams. 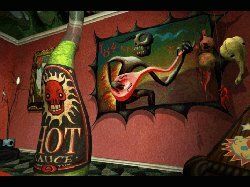 It's jam packed with striking images ... gaping mouths, misshapen guitars, grotesque bottles, clocks, eyes and eyeballs, crazy masks, and that's just the beginning. Your eyes will get tired in this world and your ears are bound to be overworked as well with the plethora of extraneous noises ... discordant guitar chords, maniacal laughter, screeches, bumps, whistles, grunts, squeals and squelches. Haven't we all dreamed of a long lost relative departing this world and leaving us a fortune? Well this is one of several games based on that premise, but this 'windfall' is not a castle or a palatial manor, it's essentially a fun park/manor called the Last Resort. It was built by your mysterious benefactor, Thurston Last, and is still inhabited by the terrible Twins as well as by the butler, Salty, and Isadora who saves and restores all your games. If you are a movie buff there's a number of well-known voices with Cher as Isadora, Christopher Reeve as Thurston Last and James Belushi as Salty. The Last Resort was once a haven for jaded artists where they could soak up the atmosphere and gain inspiration for their masterpieces, but now the Twins are wrecking everything and it is your job to put an end to their wicked ways. Salty will greet you at the door, and he'll also 'buzz' you repeatedly whilst you're exploring and give you a tip or two. He isn't overly helpful and he gets down-right annoying after his first few visits. Isadora also has some hints for you, if you can find some coins to summon her services, but she is not a great help either. The Last Resort is a haven for artists and it won't be too long before you'll realise that by this the writers mean musicians in particular, as the theme of this game is decidedly musical. Early on in your exploration you'll come across a Muse Machine with missing bits. It will be your job to find the various pieces, but as well as collecting objects and repairing various devices, or finding ways to open new locations, a fair percentage of the puzzles are in some way musical or, at the very least, aural. Though you don't need to have an understanding of music to play 9, you definitely need good hearing ... this is not a game for anyone with a hearing impairment. None of the dialogue is subtitled. There are puzzles where you must play the correct notes on an organ, tune a guitar, match sounds and rhythms, as well as an assortment of other logic type puzzles. These are rarely difficult, and neither are the other more typical adventure type problems such as pacifying an angry canine or locating items for various characters/things. The only problems that kept me thinking involved interpreting notational clues to play the correct keys on the organ at various stages of the game. These are particularly difficult, quite incongruous compared to the remainder of the problems, and you will most certainly need to keep pencil and paper handy for these brain teasers. A couple of the other 'puzzles' are also worth mentioning, including one where you must race cars around a track. Don't panic here, it isn't about dexterity and there's an easy way to deal with it. Dexterity, however, is the primary skill required for one particular 'puzzle' -- shooting the rats in the cellar. This one is bound to cause some frustration, if not heartache, for many adventure game players. I managed it without too much bother (though my appreciation was lacking) but I do know that some players have been caught up here for considerably longer than they would have liked. The game interface is simple. There is an arrow for movement which changes into a sphere when something significant appears, or into a grasping hand or pointing finger when an object can be taken or manipulated in some way. It is only possible to carry around one item at a time and there is no inventory. To indicate that you are carrying something a tiny dot beneath your movement arrow accompanies you until you have disposed of your load. The save/load game feature is accessed via the keyboard and it is here where Isadora takes charge and carries out your instructions. This screen also allows access to the game options menu where you can adjust screen transitions, sound, colour, etc. Though I concede it might have been a problem with my system configuration, the game crashed far too often at this point and it was sluggish both opening Isadora's screen and saving and restoring. Also, Isadora is quite 'chatty' and though I got used to her after a while, I'm sure that, like me, many game players prefer game saving and loading to be quick and easy with no 'frills' attached so that it doesn't interfere with game playing. Many a time as I reloaded the game after an abrupt halt when attempting to visit Isadora, her words came back to haunt me. Sadly, I didn't think that it was a 'good thing I saved just then'! 9 is certainly quite novel and innovative with its bizarre gameworld and funky atmosphere, however, it is a difficult game to categorise. Whilst it has a few regular adventure game elements such as searching for and repairing objects and finding ways to access new locations, it also has a good serving of logic or abstract puzzles. With its limited inventory it probably leans towards the latter type of game. Just who I would recommend this game for is an even more difficult question. Its numerous guitars, racing track and shooting gallery suggest that it is aimed at younger adults (it's really too difficult for children) but I'm not sure that this group of players will appreciate the slow pace of the puzzles where you must interpret the cryptic clues to play the organ. These puzzles were particularly difficult for me, even with a walkthrough, and the end game problems, in particular, drove me to distraction. Press the wrong sequence of keys too many times and the game ends unhappily ... to complete this puzzle and live happily every after means reloading endlessly. This is another game that is an acquired taste. It's crazy, and so graphically cramped it feels almost claustrophobic. You don't know which way to turn much of the time. Though it has many simple puzzles, it also has its brain teasers which will prolong gameplay considerably. Without a walkthrough I suspect that some players might not see the ending. I didn't ... even though the final problem was fascinating, my patience with reloading simply failed me. Copyright © Rosemary Young 1997. All rights reserved. Recommended for improved performance: PC with Pentium processor, 20MB or more RAM, Quad-speed or faster CD-ROM drive, High-quality headphones or external loudspeakers. Also available for the Mac.